Sony VPL-HW65ES review | What Hi-Fi? With Ultra HD 4K TV screens becoming more affordable for the home, is there a place for a £3000 projector that only does Full HD resolution? With the VPL-HW65ES, Sony appears to be convinced that there is. Having just wowed us with its stunning 4K and HDR-toting VPL-VW520ES projector just a few months ago, Sony proves it doesn’t always have to push the boundaries of picture technology to give home cinema fans a great big-screen experience. It can do just fine with a ‘normal’ 1920 x 1080 picture. Unlike its pixel-popping 4K HDR sibling, the Sony VPL-HW65ES doesn’t grab you by the eyeballs straight from the off. It coaxes you in gently and enticingly, until you’re completely immersed in what you’re watching. The picture quality is wonderful. 4K may have the extra pixels (and HDR opens up a world of subtleties), but the VPL-HW65ES’s Full HD resolution has no problem digging up fine detail. You can pick out the different textures of clothing that the townsfolk of ParaNorman are wearing, right down to ratty sneakers and the fluff on a well-worn jumper. Even in the stop-motion animated world, there’s a realistic feel to the way the trees, houses and streets look, while the green tinge around the ghosts gives an appropriately unearthly feel. Colours are natural, yet also rich. A less capable projector would have struggled with distinguishing the various hues of brown and grey in The Imitation Game, but the Sony displays the various wooden textures and black and grey suits with ease. Skin tones and textures look believable, too – there’s plenty of subtlety on show here. It’s a very filmic picture, by which we mean that it has that quality that you associate with watching film reels in the cinema: there’s the kind of depth and detail that doesn’t shout out at you, the colours and sharpness of the picture are believable, all the while completely drawing you into the film. The projector’s excellent handling of contrast is what gives it this cinematic quality. Constantine’s gothic noir palette looks appropriately moody and lush thanks to the Sony’s prowess with dark and bright scenes. Rays of sunshine permeate the shadows without diminishing the intensity of inky deep corners. The VPL-HW65ES uses Sony’s proprietary SXRD system, which is a type of LCOS (liquid crystal on silicon – a combination of DLP and LCD technology) display technology to ensure you get a strong contrast (120,000:1 in the Sony’s dynamic setting) while outputting a bright picture at 1800 lumens without ever working your eyes too hard. It’s that ability to deliver that strong contrast with such ease and subtlety that makes the Sony a truly enticing watch. If we have a criticism, it’s that the picture’s sharpness falters briefly when it plunges into a dark scene. The outline of characters and objects look just a tad unstable, but snap back to focus when the scene brightens up. Luckily, it’s not enough of a drop to distract us from enjoying our movie. The Sony won’t just do justice to your Blu-ray disc collection, it will also give your DVDs a fresh lease of life. There’s the inevitable drop in subtlety, but it’s still an enjoyable watch thanks to the Sony’s natural colours and interplay of light and shadows. While testing, we found that we couldn’t play DVDs natively through the HDMI inputs (the only source inputs available). A workaround for this is letting your Blu-ray player handle all the upscaling. 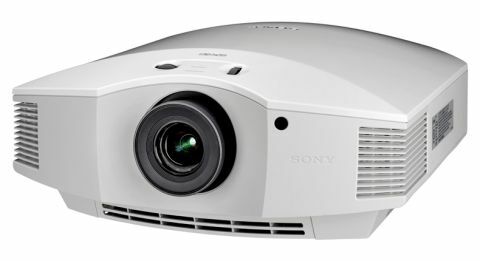 You would think that a big, pricey projector like the VPL-HW65ES would need hours to set up. In reality, adjusting the zoom, focus and lens shift to get a crisp, centred image takes just a handful of minutes. Sure, it would be even quicker if it had an automated lens shift system like on the VPL-VW520ES, but the manual process works just fine. Armed with a THX Optimzer disc, we breezed through the straightforward picture settings, too. It’s very easy to get a good picture out of the Sony. Connections include two HDMI inputs – and that’s it. There are LAN, remote and trigger ports for a home automated system, but it’s a shame there aren’t any legacy inputs for those that don’t have HD sources or want more options. And while TV manufacturers (such as Samsung and Philips) are starting to phase out 3D, the Sony projector still features active 3D for those who want it. You will have to dish out around £50 apiece for 3D glasses though, as none are supplied within the box. The projector itself is sturdy and hefty. Its curved shaped and minimal design means it never looks bulky, so it shouldn’t stick out in your living room. It’s available in black or white finishes, and the included remote control is neatly laid out and responsive. We could watch movies on the Sony VPL-HW65ES all day long. If you’re in the market for a great sub-£3000 projector for your home, it’s definitely worth considering. In fact, this projector is now the same price as one of our 2015 Award-winners – the VPL-HW55ES – making the bigger-model Sony an even better proposition than before. But in the current technology climate it matters that the VPL-HW65ES projector doesn’t do 4K. For those wishing to be future-proofed, it won’t be high on their wish list. The stunning 4K and HDR-capable Sony VPL-VW520ES is the clear choice here – but it does come with an £8,800 price tag. Not everyone is chasing the latest technology, nor has the luxury of spending £9K on a projector. Most of us just want a big, cinematic picture that looks good with our vast collection of Blu-ray and DVD discs. If you’re not concerned about future-proofing just yet (and it will be a couple of years before 4K Blu-ray discs become truly mainstream), then we’re confident you’ll be more than happy with the Sony VPL-HW65ES.